TVPaint Animation works with Projects which contain the artist's creations. The notion of project is vast and further details will be provided during the first lessons. * Use the File main menu. * Use the keyboard shortcut [Shift+N]. * The Name of your project. * Its Width and Height in pixels. * The Aspect Ratio of the pixels. * The Frame Rate (images/sec). * The Field display mode. The Template concept will be discussed in lesson 8. The Project with camera tab will be discussed in lesson 8. 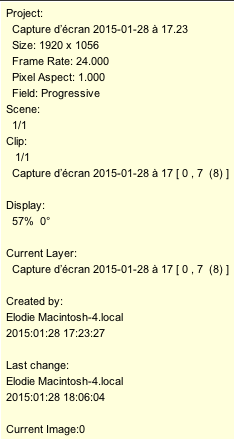 Setting each parameter to create an animation in the format of your choice may be long and arduous. Therefore, a popup menu has been added to the panel to allow you to set the various numeric fields according to the most commonly used formats : PAL, NTSC, VGA, DTV, Film, etc. * Display : the format of the screen. * Clipboard : if there is an image in the Clipboard. * Current Custom Brush : if a custom brush exists. * The Current Project format. 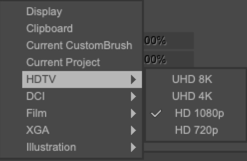 TVPaint Animation uses all standard formats (even very high definition) both for image width/height ratios 4/3 and 16/9 as well as others. Once all options have been selected, click on New Project. A project window then appears on screen (see below). It is in this window that you will work on and view your creations. TVPaint Animation allows you to work on several projects at the same time. The maximum number of projects is limited only by the capabilities of your computer. To view data relative to your current project (size, framerate, ratio, etc...), simply move the cursor over the title bar and hold it there. A small yellow window then appears with all the information you require. The default name for a new project is "Untitled (01)", "Untitled (02)", etc.. To render there names more understandable, it is possible to rename them as you wish. To do this, simply use the Project > Rename main menu.